By mail. City of Ann Arbor and Barton Hills Village are direct-mailing/delivering to most households in their communities the week of December 15th. From HRWC. You can pick one up for FREE at the NEW Center, 1100 North Main Street, Ann Arbor, Mon-Fri, 9am-5pm (check the literature rack in the lobby). Or contact Pam Labadie at plabadie@hrwc.org or (734)769-5123 x 602 to have one mailed to you for $5. 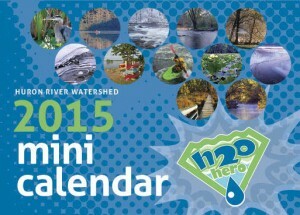 The Huron River Watershed 2015 Mini Calendar is a collaborative effort to educate residents about the importance of water stewardship and nonpoint source pollution prevention. The communities listed above believe there are substantial benefits that can be derived by joining together and cooperatively managing the rivers, lakes, and streams within the watershed and in providing mutual assistance in meeting state water discharge permit requirements. HRWC would like to thank them for their continued support of the calendar program which has distributed over 240,000 calendars to watershed residents biannually since 2003. The 2015 Mini Calendar is the first “annual” edition. Calendar photographers are Marc Akemann, Ted Nelson, Keith Matz and graphic design/illustration is by Christianson Design.